"It's been wonderful; it's been everything Brayden Automation promised it would be. I wish everything worked as well as this does." Jimmie Wolfrum, the owner of Jim's Automotive Machine Shop, is referring to the Energy Sentry 9388B Demand Controller. For over 13 years, Jim's Automotive has used the 9388B to control their peak energy demands and save substantial amounts of money on their electric bills. 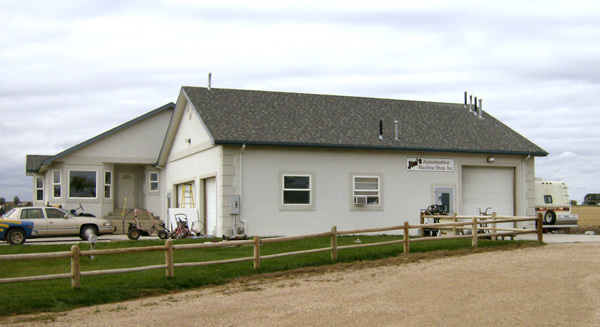 Jimmie first contacted Bill Brayden, President of Brayden Automation, in 1997 to find a solution for staying under 25kW demand, the threshold between Xcel Energy's "C" Small Commercial and "SG" Medium General Service rates. At the time, Jim's Automotive Machine Shop was located in Greeley, CO. Jimmie had been working with several electricians to stay under the 25kW demand threshold, but "all of their suggestions were complicated." His brother-in-law referred him to Brayden Automation and suggested their demand controllers. "Brayden's product seemed so straightforward to me. It was a simple system and very reasonably priced." From the start, Jimmie felt it would be well worth the investment. "Every product you buy has some risk to it, and this option seemed well worth the gamble." Bill Brayden decided the 9388B was the best option to control Jimmie's loads and keep his peak under 25kW. Jimmie was most impressed with the time and effort Bill put into finding a solution and implementing it. "Bill was great. He showed up to the building himself to figure out what we needed. He was right there pointing us in the right direction. Anytime we've needed help, Bill has always been available to figure things out and make sure everything is working exactly how it should." Jimmie has since moved his company to his home in rural Weld County near Gill, CO. To insure continued savings, Jimmie moved the demand controller to his new location. The 9388B controls seven main electric loads: the residential clothes dryer, an air conditioner/ heat pump, a 10kW three-phase bake oven, a small 5 hp jet wash cabinet, a large 10 hp jet wash cabinet, (both used to clean engines and other engine components), an airless steel shot blaster, and a 10 hp air compressor. At the previous location, Jimmie was saving significant amounts of money on his electric bills by being able to stay under the 25kW peak demand. At the new location, Jimmie only needs to stay under 37 ½ kW to remain on the small commercial rate. The demand controller is now used more as a safety net keeping them within their demand range. Currently, by changing to a time-of-use electric rate, Jimmie is saving an additional 10-15% on his electric bills by using the 9388B to control when certain electrical loads can be operated. Jimmie's been extremely satisfied with his 9388B controller. "I would definitely recommend Brayden Automation's demand controllers. There have never been any problems with the controller. Anytime there was an issue, it was usually on our end, and Bill was right there to help us figure it out." One of Jimmie's favorite aspects of the 9388B is how simple the demand controller is. "It is very easy to use. It takes some time to figure out exactly what loads you want to control, and to set it up. But once it's set up, it takes care of itself." The Energy Sentry Model 9388B is the ideal solution to controlling your peak demand. By controlling how you use your electricity, you can use the same amount of energy each month at a distinctly lower cost. As your partner in savings, we'll work closely with you to determine the proper demand levels for your office, business, church or other commercial facility, and we'll help you set the Energy Sentry for maximum savings and the greatest convenience. 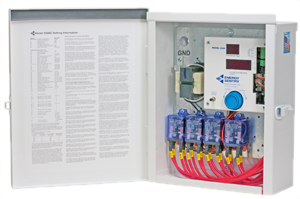 Once installed, the Energy Sentry goes to work measuring and calculating the proper time and level to manage certain loads in your facility. Do you have High Electric Bills? WOW... Look at the Savings!